How about those quarter finals eh? Pretty nifty stuff. Congrats to TSM and Dignitas on their wins. 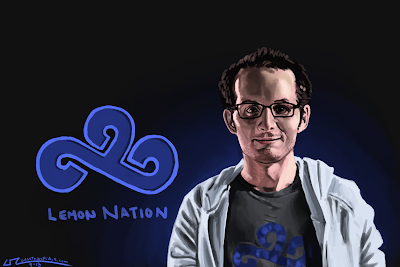 This here is LemonNation, (I'm assuming you skipped the title and caption to get here) Cloud 9's support player. I put a fair bit of effort into this one clocking in at 2 hours on and off. Unfortunately I didn't record the whole process so you'll have to forgive once I get the process videos up on my channel. If you haven't yet you can check out my other speed paints of Balls, Meteos, Hai, and Sneaky by checking clicking their names. Been a busy last few days... But I managed to get this one done before the end of the week. My daughter (the bigger one) has the early signs of pneumonia. So most of my attention has been there. I'd like to see the Cloud nine videos up and running by the time the regional are over... but hopes don't always line up with reality now do they? Well that's said I'm hoping you guys enjoyed this little mini series definitely let me know what you'd like to see more of. And I'm hoping that Cloud 9 comes out of the regional championships with a win. Comments, questions, suggestions on this piece or future ones? Leave them below for me. As always God bless, be safe.